My latest creation... I have always liked anthropomorphic images so I created my own by taking a vintage photo of two people and giving them ostrich heads through the magic of photoshop. I was very happy with how the turned out and so I made them into soft scupltures, you can find them in my etsy shop. Want more anthropomorphic? Look here. Amelia received a first place ribbon for her science fair project, "What happens when gummy bears swim in cold water, hot water, soda and salt water". She really enjoyed working on the project, she set up each trial, colored all the charts, wrote out her whole log book and cut out most of the items for the display. I was very proud of all her hard work. Because she got a blue ribbon she gets to enter the school district science fair next month, go Amelia! Her photo cracks me up, she is doing the space out look where she is not really looking at anything. She looks dazed, it must be the blue ribbon, she was so excited to get a ribbon! A friend told me about her music, it's so sultry, old school jazz. I'm digging it! My two favorites are "Our love is easy" and " Goodnight". 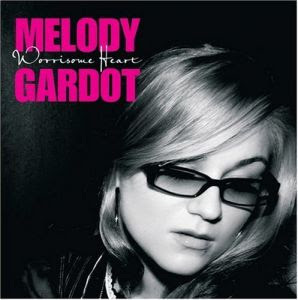 Check her out on itunes. So I finally made my first trip to Whole Foods today. I've been a dedicated Schnucks girls for as long as I can remember, I know that store like the back of my hand and could probably shop blind folded with no problem. So going to a new store is always nerve racking to me. I felt like a wide eyed kid, not knowing where to go. Anna & I wondered down each isle to see what all the hoop la is all about. I must admit the store smelled really good, probably that wood pizza oven. And the produce all looked great, that was the one thing that has been lacking at Schnucks and drove me to try Whole Foods. I just wanted to find some good lettuce! I get the whole orangic thing and I really like the no preservatives. I bought some waffles, we will see what Brian says, he loves Eggo's and he will be hard to break. I should have saved the Eggo box and stuck these inside. I'll let you know how those go over. The main thing is the prices, wow, they are high! The produce was not too bad and I don't mind paying more for some good lettuce. But the box of cereal was $4.39... I hope the girls like it. I took a photo of the 15 items I bought, can you guess what I paid? Tip, I did get 1/4 lb chicken salad and chicken scallopini from the prepared foods counter. I'll go back for the produce and maybe waffles (if Brian and the girls likes them). But I think I'll stick to Schunks for my staples. The girls love to set up their toys into little scenes and 8 out of 10 times they are sitting and eating. Here Bat-mite has pie with the fairies Fauna & Merryweather. I love these little set ups and I often wonder what they might be saying if they came to life. Bat-mite: Thank you for making this tasty pie Fauna. Fauna: You're welcome, I wanted to thank you for taking time to sweep the snow off my sidewalk the other day, we were very grateful. Bat-mite: Anytime... did you watch LOST last night? So what's up with Ben, is he the devil or what? Amelia had her Valentine Party last Friday and she was so excited to get the Valentine cards. I was pleasantly surprised by all the homemade cards, there were some really cute cards! I think it's funny how when I was little it used to be just cards but now the cards includes candy, stickers or tattoos. She even got two goodie bags. At least they still call it a Valentine's Party, Anna's class had a "Friendship Party". Taken from the words of Charlie Brown... Good Grief! This is my first pattern I have made for etsy. I drew these character's for Anna's birthday party invitation last year and I think they are pretty cute. I made them into this embroidery pattern and have listed it on etsy. It was fun to make and I'll need to do more. The only down side is the thought of actually using the cute towel in the kitchen makes me cringe. I know it will end up with a big spaghetti sauce spot... oh well I guess that would be a sign that it was well used and loved. 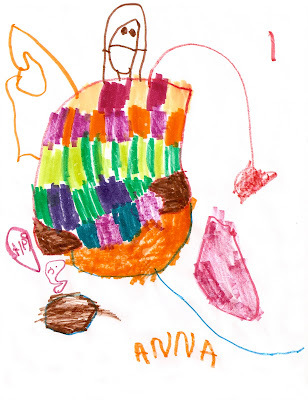 Anna is developing her own style of drawing, she loves to color in blocks of color and her faces all have a straight line for the mouth. I know I keep saying this, but boy do I love my girl's drawings! I designed this wedding shower invitation for my cousin's shower. Their colors are brown and purple and since it was a winter wedding, snowflakes were a theme. I used an embossing powered for the snowflake stamp. I bought a heat gun just to make these and that thing is cool! I need to find more things to emboss! My Dad brought over my old sleds a few weeks ago and it finally snowed just enough to take the girls sledding for the first time. I grass was peaking through the snow but they didn't care, they loved it! The bottom photo show us on the ski sled bike, this is from the 80's, my brother Brent and I loved this sled. The photo does not show it but the front has a ski, no wheel. The good thing about this sled is that you can easily steer around trees or people in your way. The only down side is when we would go sledding everyone else also loved this sled, most had not seem anything like it, and wanted to try it out. The girls are waiting for more snow and more sledding, so I hope we get one more big snow fall before the spring. This is my latest creation... Mabel the Mouse... she is made with 80% upcycled materials and no pattern... so she is wonderfully unique! I also made my first stop motion video staring Mabel. I really enjoyed making this video clip,I've been wanting to do one of these for awhile. When Amelia saw it she was so excited and asked how is Mabel walking? When I told her that I made her do that she seemed a bit disappointed that Mabel had not magically came to life. Both girls now want to make movies with their plushy friends, so stay tune for more. Amelia just had her 100th day of school last week. They had to make a t-shirt with 100 things on it so we did 100 googly eyes. She wanted to add two red bows on the shoulder, which did make it extra cute! She came home from school with her 100 glasses and 100 hat. Sounds like they had a fun day at school. Brian brought home this movie rental called: Moon. I had not heard anything about it and I never saw one preview. 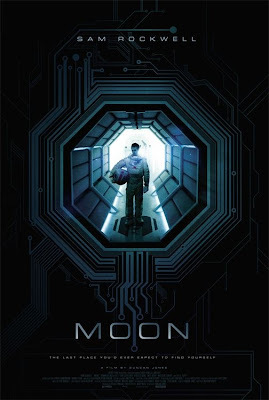 I really enjoyed this movie and give it an A. I'm not going to tell you anything about it except that it takes place in space on the moon and it's worth the time to watch... enjoy! I make a lot of items for my etsy shop and the girls always ask "who is that for" as I am making it. I know they are hoping it's for them, which makes me feel quilty. But I do make a lot of toys for them! Anna: Mama would you make me a toy? me: Yes, what would you like? me: I think I can do that. Anna does not ask for much and it's been awhile since I made her a new plushy friend. I made her this elephant out of an old gray sweatshirt and her favorite pokadot dress that she just outgrew. She hasn't put her down for two days, it's her new buddy called Diamond. Photo: Anna is wearing the flower girl dress from my brother's wedding a year ago. Both the girls love to wear those dresses around the house.